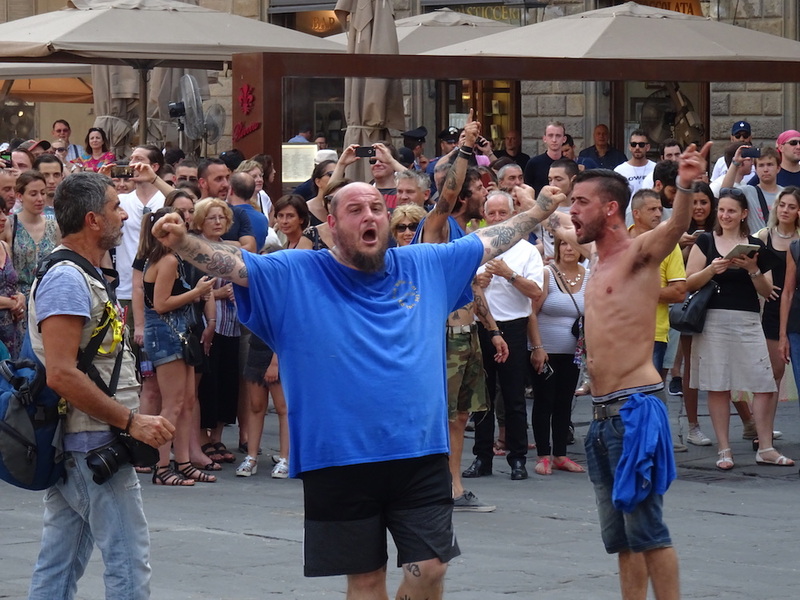 On one side of the Piazza Della Signoria in Florence, a group of young men gathered outside an Irish pub in matching white t-shirts, chanting raucously and bearing more than a passing resemblance to a British stag trip. On the other, in front of a replica of the famous statue of David that is housed in a nearby museum, 12 young women were performing a slow, Tudor-style dance in period costume. It was a scene to sum up what makes Calcio Storico Fiorentino unique. A parade entered one corner of the square. Men dressed like jesters carrying crossbows were interspersed with the hulking bodies of the competing athletes. A moustachioed gentlemen carrying two balls, one red and one white, gave the final clue for what was about to unfold as the swarm of people snaked its way towards the purpose-built arena in Piazza di Santa Croce. 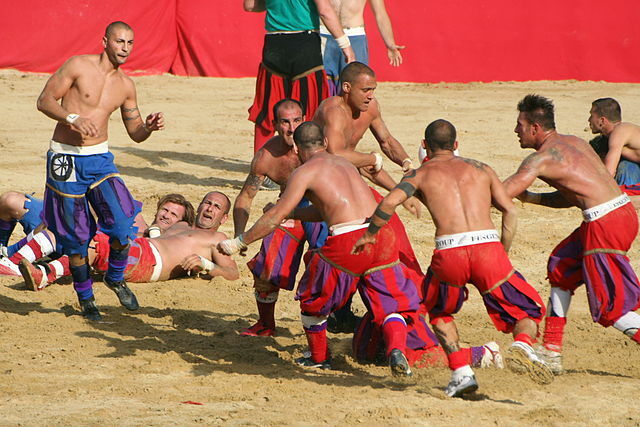 Calcio Storico was an early form of football played in Italy, thought to have begun in Florence in the 16th Century. In 1930, some three hundred years later, it was revived as an annual tournament with the final held on the 24th of June to mark the feast day of St. John, the city’s patron saint. Every year, teams representing each of the the four quarters of the city do battle, with local pride and huge amounts of machismo at stake. Santa Croce are the Azzurri in blue, while the area surrounding the city’s famous Il Duomo cathedral is represented by San Giovanni Verdi in green. Santa Maria Novella Rossi play in red, while the only team from south of the river Arno is Santo Spirito, the Bianchi in white. It’s a notoriously violent spectacle. Two teams of 27 players are crammed into an 80 x 40 metre arena covered with a layer of sand more than a foot deep. Punching, kicking, headbutting and choking are all permitted, although the rules do prohibit players from teaming up to attack an opponent. The game runs for 50 exhausting minutes with no break and no substitutions allowed. One caccia is awarded for throwing the ball into the narrow band of the opposition’s goal that runs waist-high upwards across the full width of the field. Half a caccia is awarded to the opposition if a shot goes above or below the goal, so accuracy is vital. In practice the game is a mix of football, MMA and American football. The big guys in the team punch and grapple with their opposite numbers, trying to pin them to the ground to create gaps for their nimbler teammates to scurry through and score. While the scoring determines who wins, the violence drives the game’s reputation. A French king observing one of the original games is said to have described it as being “too small to be a real war and too cruel to be a game”. 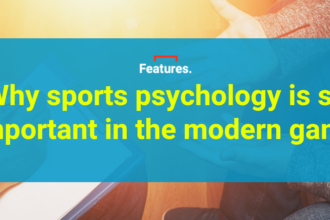 The modern game is not much gentler, and the competition was cancelled for a year after 50 players were taken to court following a brawl in 2006. New rules have since been introduced, banning convicted criminals and requiring all players to have been born in Florence or lived in the area for at least ten years, to try and place some restriction on the violence. How successful that has been is rather doubtful. After the Rossi of Santa Maria Novella thrashed San Giovanni’s greens 11.5-4 in the first semi-final of this year’s contest, the second semi-final descended into mayhem. Only 17 minutes into a rematch of the previous year’s main event, and with his team leading 2.5-0, one of the players wearing the blue of Santa Croce punched an official. There may be few rules in this game, but this is definitely forbidden. When the offending player then refused to leave the field an enormous 40-man brawl spiralled out of control and had to be broken up by riot police. Once calm had been restored, Santa Croce were expelled from the competition and the Bianchi of Santo Spirito progressed to the final, giving them the chance to retain the title they had won the previous two years. If you feel sorry for the referee who took the punch, spare a thought also for the rest of Santa Croce’s team, who spent four months training for the competition and saw it brought to an unexpected end after barely a quarter of an hour. As the players and their supporters paraded through Piazza Della Signoria it was easy to see how the semi-final results had come about. The greens were by far the smallest and meekest, in stark contrast to the enormous men making up the red team that had trounced them. The whites were more like the greens in stature, short and lean, but had a mean look about them and huge support. The expelled blues, meanwhile, were clearly still angry and unfurled a self-censored banner that claimed “The law is equal to x all”. They prowled around beating their chests and had a bit of a stand-off with the group of Bianchi supporters outside the Irish bar that was only defused when they got distracted by the notion of bullying a Rossi supporter into being in a photograph with them. Those about to take part in the final were enormously hyped up, even 90 minutes before the game started, and there was a slight edge to the atmosphere as baffled American tourists gaped at the show of aggression. The final itself was one for the ages. As the cannon that starts the game was loaded, the man standing beside me said with more than a little glee, “time for some unrelenting violence”. That was how it played out for several minutes, with the Santo Spirito Bianchi keeping the ball in their own half while their big men brawled in the middle of the field with their opposite numbers from Santa Maria Novella Rossi. Within three minutes a Bianchi player was on the sideline being bandaged up, and shortly afterwards one of the Rossi was led to the side with blood pouring from his head. It was almost five minutes into the game before the Bianchi made any kind of real attack, just holding the ball while the heavies scrapped things out, and when they did make their move it was a mistake – the shot was too high and the Rossi were gifted a half-point lead without even touching the ball. An early highlight came when one of the Rossi players launched a flying head-height kick, travelling several metres through the air in the process before landing in a heap on the floor after missing his target. It disrupted the Bianchi’s flow, however, and shortly afterwards the Rossi broke from their own line and virtually slam-dunked the ball to score the final’s first caccia and extend the lead to 1.5-0. That held until the 20 minute mark, when the Bianchi began a remarkable spell with a long throw slung from barely inside the Rossi half that got them off the mark. Within 12 minutes they had raced into a 4-1.5 lead, the flurry of scoring completed after a speedy Bianchi player made an extraordinary run from inside his own half, evading a series of flying tackles. The intensity started to crank up. A Bianchi player unleashed a kung-fu kick to the chest of an opponent that looked like something from a video game. 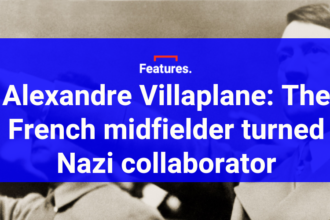 One of his teammates had been strapped up with three inches of bandages around his face in attempt to keep his nose in place – but that still wasn’t enough to stop him being dumped face-first into the sand. Despite the temperatures soaring to 32 degrees, somehow the players kept throwing punches. As more players struggled with injuries and fatigue the game became far more open. The medics were becoming a permanent fixture on the field, and at one point there were seven medics all crowded around the same injured member of the Rossi team. But this was the final of Calcio Storico, and so he hauled himself to his feet to continue. Perhaps inspired by their teammate, the Rossi began a stunning comeback. From 5-2.5 down with less than ten minutes remaining they scored three times in quick succession to take the lead. The third of those goals came as the tired Bianchi defence desperately tried to cling on by just hurling the ball downfield towards the Rossi goal. The ball was intercepted and returned with speed, and the Rossi comeback was complete with just two minutes to play. Or maybe not. As the clock ticked past 49 minutes, the Bianchi launched a final hopeful shot from halfway – a Calcio Storico Hail Mary. It fell pitifully short, but an unlikely bounce kicked the ball onwards and upwards. It nudged rather than crashed against the crossbar, but that was enough for it to fall down and into the Rossi goal. Somehow the whites of Santo Spirito had pulled themselves off the canvas with a last-minute winner to complete a hat-trick of successive Calcio Storico victories. Bianchi flags waved and pyro was set off in the stand. Bloodied and broken bodies collapsed in the arena, before the winners gathered and slumped together for the obligatory team photo. There was no medal ceremony. Calcio Storico Fiorentino is all about pride, fighting for the team and the area that you represent. The prize for the players of Santo Spirito Bianchi overcoming two sets of terrifying opponents was merely a free meal at a local restaurant. That and another year’s bragging rights in this most extraordinary competition. Next articleWill 2017 bring a Brazilian winner in the Copa Libertadores once again?